Which Baby Carrier Or Sling Should You Buy? - Which? Expert advice on what to look for when buying a baby carrier or sling, so you can choose the best for you and your child. Choosing the right baby carrier, sling or wrap is the key to getting to grips with baby wearing. It needs to be comfortable, convenient and flexible for your little one, as well as for you and anyone else who'll be wearing it. Compare our baby carrier and sling reviews to find the best one. A wrap sling is simply a piece of woven or stretchy jersey-type fabric that you wrap and tie around your body so your baby is held securely. Pros: By wrapping the fabric around the waist and shoulders, you can distribute your baby’s weight, which makes these slings comfortable to wear over long periods of time – even with a heavy toddler. The wrap can also be folded up and used as a blanket or changing mat. There are numerous different sizes, tying methods and carrying positions, and excess fabric can be used for discreet breast-feeding. Cons: Although they're the most versatile, they're also probably the most difficult type of sling to get the hang of, so follow the instructions carefully until you're sure what you're doing, forward-facing carrying isn't generally recommended with a woven wrap. Age suitability: Wrap slings are suitable from birth to around one year (or up to 9 kg). Soft baby carriers, or buckle carriers, are the most widely available type. Most are either two-way or three-way carriers, which reflects the number of positions you can carry your baby in. Pros: They're usually easy to learn to use and are adjustable, so they can be used by more than one parent. Cons: It can be harder to breastfeed in these than in other sling types, and some require you to use an additional insert with newborns. Price: Varies very widely – from £30 to £100+ depending on features and brands. Age suitability: Most soft or buckle baby carriers are suitable from birth to 12kg (around 18 months), but they can go up to 20kg depending on the brand. A pouch sling is a piece of fabric sewn together at the ends and folded to form a pocket in which your baby nestles. Pouch slings go over one shoulder like a sash, and your baby sits in the pouch on the front or back. Pros: These slings are usually quick to get on and off, and compact enough to fit easily into a changing bag. Plus, they are reasonably priced. Cons: Most aren't adjustable, which can make it difficult to get a snug carrying position, especially for newborns. Make sure you choose the right size – mums and dads will probably need one each. Price: Can start from as little as £15. Age suitability: Pouch slings can be used from birth to toddler, but because the weight of your baby is concentrated mostly on one shoulder, you might not want to use it as your child gets larger. A ring sling is a piece of fabric that threads through two rings, forming a loop. The sling goes over one shoulder, and you fasten it by pulling the fabric through the rings. Pros: Ring slings are quick to get on and off, and one sling should fit both parents. They're ideal for breastfeeding, as you can use the tail of extra material to discreetly cover you and your baby. Cons: Some rings have padding in the shoulder and edges for comfort, but very padded versions can be more difficult to adjust and may be bulky. Ring slings can become uncomfortable over long periods of time when used with heavier children. They also don't distribute your baby’s weight evenly between both shoulders, so wearers with bad backs should be careful to switch sides. 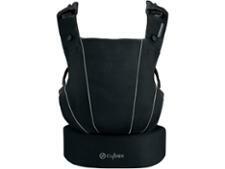 Age suitability: Ring slings are suitable to use from birth to toddler, normally around 15kg. Baby backpacks have a rucksack-style appearance and are usually supported by a light metal frame or rigid backpack-type padding. You secure it using padded shoulder straps and a waist belt. Those with a metal frame are usually designed so you can stand the carrier upright on its own, making it easier to get your child in and out. With some, you can buy extras such as sun and rain covers. More expensive models are made by outdoor clothing and equipment specialists, and some have space to store extra clothing and food. Pros: Lots of adjustments are possible, and both parents can use the same backpack carrier. Because your child will be high up, he or she will be able to get a good view of the world – although you'll need more space to turn around, and must allow extra head space when going through doorways. Cons: Size is the main drawback with framed carriers. Watch out for the metal parts of the backpack getting uncomfortably hot or cold to touch. Price: They range in price from about £50-£100+. Age suitability: Baby backpacks are generally suitable from around six months, and some can be used up to 20kg (around four years old). With a hip seat-type carrier you carry your child on your hip. The most popular brand is Hippychick. It’s essentially a back-supporting belt with an integral padded foam shelf that your child sits on. This prevents you having to push your hip out to one side, which may cause hip and back ache if you carry your child for a long time or they’re especially heavy. Pros: They're quick and easy to put on, can be worn by either parent, and are easy to adjust. Cons: There are no straps to hold your child in place, so if they’re especially wriggly or determined to get down, they may slip off it. It’s not a hands-free option, as you’ll need to keep your arm wrapped round your child for security. Age suitability: Suitable from six months to up to three years, or 20kg. What's the most popular kind of baby sling or carrier? When we surveyed parents, we asked them what kind of carrier they used or owned. Top of the list is a soft structured baby carrier, with 61% of parents saying they owned one. You can buy soft structured carriers from brands such as Baby Bjorn, Cybex, and Mamas & Papas. 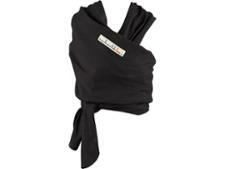 The second most popular type is a wrap sling, such as those from Moby or Je Porte Mon Bebe, which 19% of parents own. The third most popular carrier is a pouch sling, with 12% owning one of these. Ring slings and wraps are owned by 5% of parents – popular brands include Close Caboo and Rockin Baby. Baby backpack carriers are owned by 4% of parents. Front carrying or back carrying? When you're babywearing, you often have the choice of how you want to carry your baby: on your front or on your back. Front baby carriers are most popular. Some baby carriers and baby slings have the option to hip-carry, too. You can use it from birth as long as your baby meets the minimum weight requirement. Most of the slings and carriers we've tested go up to 35lb (16kg) for front carrying, which is around three or four years. You can see your baby clearly and bond with him or her. You can often breastfeed discreetly using a front carrier. They're useful if your baby has reflux and needs to be kept upright after feeding, or just really doesn’t want to be put down. Some front carriers have a minimum weight limit before you can use them. Some may not be suitable if your baby is premature. Older babies might 'grow out' of wanting to be carried on your front. Great for extended carrying – especially older toddlers or children, who may get too big to go on your front. Suitable to be used only once your baby is able to sit upright (from around six months). Some parents find it hard to manoeuvre a child into position. Some back carriers need two people to get a child into place. For the best of both worlds, choose a baby carrier with multiple carrying positions for maximum comfort for you and your baby as they grow. Which baby carrier is most comfortable? Baby carrying is quite a personal thing, and how comfortable it is will depend on the wearer, and getting the right type of carrier for you and your baby. Slings and carriers shouldn’t give you aches and pains, even after prolonged use. Some parents in our tests felt discomfort in the shoulders, lower neck and lower back, but issues like this can be fixed by making some adjustments to the straps or buckles, and making sure the carrier is correctly fitted in the first place. It can take a little while to get used to wearing a sling if you haven’t used one before. So if you’re new to babywearing, we’d recommend building up gradually before keeping your sling on for a long period of time. If your baby hasn’t been in a sling before, it’s possible that they may cry when you first put them into it. It’s a new experience for them, and some babies may not like it initially. This can be quite worrying for a parent but, if your sling is on correctly and your baby is positioned correctly, usually a little walk around or a jig about and some comforting words can help them to settle. Many factors can affect the comfort of a sling. If your baby has had you up many times overnight, if you feel stiff after sleeping awkwardly, or are achy from an exercise class, for example, this can affect how comfortable you feel when babywearing. 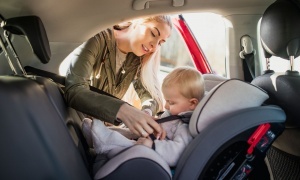 Choosing a carrier with good features, such as lumbar support or padded straps, can help to reduce discomfort, especially if you plan to carry your child for long periods of time, or regularly when they're older and larger. How much do you need to spend to start babywearing? We’ve found some of the best baby carriers and slings cost from around £40 upwards, so there's no need to spend a fortune. A comfortable baby carrier or sling will mean you can carry your baby for longer. 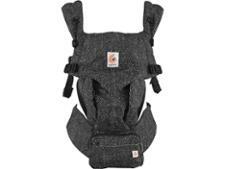 Features to look for include thick, padded straps; sturdy fabrics; and good leg and back support for your baby. As part of our tests, an ergonomics expert assesses each sling and carrier for how supportive it is, for both the wearer and the baby. We also take into account feedback from the parents in our user trials. To double check how comfortable a carrier or sling is for you, we recommend trying it before you buy. Head to a sling library, which will have a range of slings and carriers to try out. You’ll be able to get tailored advice on things such as getting the most comfortable fit for you, and adjusting your sling or carrier safely. The weight of a baby carrier or sling can vary. A lightweight sling can weigh as little as 400g (that’s less than half a bag of sugar), while a structured baby carrier can be a lot heavier, as well as being big and bulky to carry around. The slings and carriers we've reviewed recently weigh around 0.3-0.7kg. You may not be quite as concerned about how bulky the baby carrier is – or how well it packs up – if you're wearing it only indoors. But if you want to use your baby carrier when you're out and about, you may want to go for one that's light and folds up neatly when not in use. Also for outdoors, consider a sun canopy to help protect your baby's head from the sun. Some carriers also come with sleep hoods. Both of these will add bulk, but are handy extra features. If multiple people are going to be using your carrier or sling, it’s definitely worth choosing one that's adjustable to help get the best fit. Adjusting your baby carrier properly is vital, so it's useful to have one that you can get the hang of fairly easily, with good instructions to help. If you're willing to invest time in learning how to adjust a sling or carrier, your range of choice is greater. If you don’t have the time or energy, choose something straightforward with a minimal number of adjustments. For those who don't feel confident in working out how to carry a baby in a wrap, then a more structured carrier might be the way to go. When choosing, consider whether you can get it on and off easily – while juggling a crying baby – and whether you can get it on and off on your own. Our reviews assess these factors based on parent trials and expert assessments, and we also look at the clarity of the instructions that come with each carrier. Most manufacturers have videos available to help you learn how to put on your sling or carrier. We’d recommend taking a look at these and practising with a teddy to get to grips with it before your baby arrives. A sling or baby carrier is bound to get dribbled on or vomited on at some point. Check whether the one you've got your heart set on is machine washable rather than sponge-clean only, or comes with any other handy features such as dribble pads. How long can your baby stay in the carrier? You can carry your child in a sling or baby carrier for as long as they are content and you’re happy carrying them. Make sure the sling is adjusted properly and that your baby is comfortable. Always follow the TICKS advice (see below) for the safest way to carry your baby. We’d advise starting with a short 10-minute carry to let your baby get used to the carrier, and gradually extend this to longer periods. Always pay close attention to your child’s needs and switch between the baby carrier and, for example, a pushchair or carrycot as needed. Yes, if used properly. It's important to make sure you know the basics of sling and carrier safety before you start using one. Follow the 'TICKS' rules for safe babywearing, and read our guide to baby carrier safety to learn about safe positioning for your baby, as well as keeping your back and spine protected. Which baby carrier can you breastfeed in? Many of the slings and carriers we’ve tested have a position for breastfeeding. Check our reviews, or the instructions, to find out which ones are suitable. Which baby carrier is best for newborns? Many slings and carriers are designed to be used with newborns. You may have to put a special insert into the carrier, which helps to raise your newborn so that he or she sits higher on your chest. The top of your newborn's head should be close enough to kiss. Check the product specs or instructions to find out if the sling or carrier is suitable from birth. 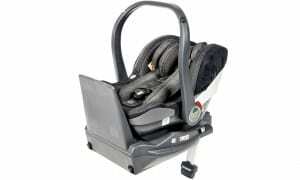 Some carriers are suitable to you with much older babies and toddlers, too. If you’re planning on babywearing for a long time, look for one that will last. Some parents find it less comfortable using a baby carrier as their child gets heavier, and toddlers might not want to be carried once they become more active. This depends on personal experience, though. Other parents don't tend to notice the weight of older babies if they’ve been carrying them since they were little, as their body gets used to it. Given the importance of practising babywearing, finding out what's most comfortable for you and adjusting your sling or carrier safely, it can be really helpful to visit a sling library or consultant to try any slings you're considering before you buy. 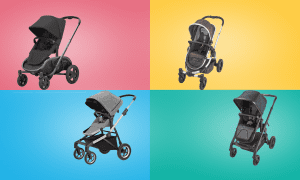 BabyBjorn, Ergobaby, or Mamas & Papas? There's an enormous range of baby carrrier and sling brands out there. Some are very well known and established, such as BabyBjorn and Mamas & Papas, while others are much smaller companies, often selling slings. Babybjorn and Ergobaby are specialists in making soft-structured baby carriers with buckles and waistbands, although Ergobaby has also created a fabric sling. They sit at the top end of the price bracket. Other well-known brands and names, such as Chicco, Mamas & Papas and Mothercare, make structured baby carriers, at lower prices. Less well-known names, but equally popular with some parents, are brands such as Close Parent, Moby, Connecta and We Made Me. These brands make a mix of slings, structured carriers and hybrid carrier slings, which have and buckles and straps, but may have less padding or lack a waistband. Visit our best baby carrier and sling brands to find out which brand parents rate highly. Buyers beware: there's a large counterfeit market for certain carrier brands, such as Ergobaby and Moby Wrap. You'll need to be discerning when looking for a deal, otherwise you risk buying an unsafe product. Read our guide to spotting a fake baby carrier or sling so you know what to watch out for. Babies love to chew on the straps or fabric of baby carriers, so it’s wise to have a dribble bib or bit of muslin to hand. They can also help you to protect your clothing and tidy up more quickly if your baby is sick while in the carrier. Some carriers come with dribble bibs, while others brands offer them as an additional extra. Overall, we haven't seen much advantage in buying a carrier simply because it includes a dribble bib.